Accept it, we all love taking awesome vacation photos. So, what would be the best possible angle to click a picture that would result in garnering a large number of likes on Instagram? Well, there have been some tried and tested ways to make your photos look more Insta-worthy, and give you that extra push towards 1000 likes. Let’s check these awesome vacation photos. How many times have we seen a group posing in such a way that their shadows/reflections make up the word ‘Happy’? Well, it is a sure way to get an appreciation for your vacation. Use your long braids for another innovative picture. After all, if companies can use hair to market their product, why can’t you, all in the hope of marketing your photo! We all love a good burger, don’t we? MacDonald’s, Burger King, Subway, all have their charms and aesthetic appeal, but how many of us would love a human burger? No, not to eat, but to see on Instagram and appreciate! Every year, thousands of tourists spend their beach-time trying to recreate the perfect, never-ending, half circle that looks good on Instagram, but it is very tough to create! Most of the times, your Instagram handle is filled with the same old drudgery of mirror selfies and candids. Why not spice it up with some chasing the sun pictures? There is always a superhero fan in the group that would love to pose like Goku from Dragon Ball Z. But, you also need another partner who is willing to be the victim. There is always something that might photobomb you. But, wouldn’t it be better if it were a fish? Just hold up a ring while taking the photo, so that you can metaphorically hold your friend within a circle. The latest trend in selfie culture! It needs you to pose vibrantly with a lot of people, to take the perfect selfie, ever! The most common yet iconic pose, recreated a million times. Be aware that it might make you look cheesy, but if you are cute, it might make you look adorably cute too. So that’s a plus. 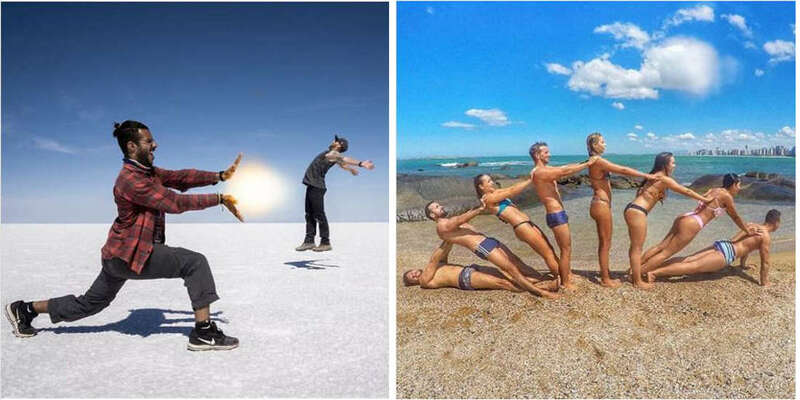 Bring out your camera, choose one of these poses, and snap a quick one!